Building toys are an integral part of childhood. Building engages the imagination and coordination of kids. K’nex is a toy building system which consists of interlocking plastic rods, connectors, blocks, gears, wheels, and other components, which can be pieced together to form a wide variety of models, machines, and architectural structures. K’nex can be used to construct innumerable creations because many different pieces which can interlock at different angles and directions. Various playsets from K’nex are all compatible with each other. Because K'Nex pieces are made of a strong plastic and interlock, these constructs are usually sturdy. K'nex Toys are limited only by the imagination. Holdson is proud to distribute this brand in New Zealand. 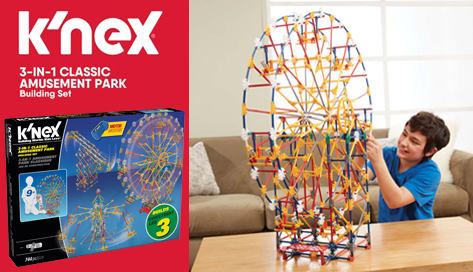 Operate an amusement park right in your home as you build thrilling rides with the KNEX 3-in-1 Classic Amusement Park Building Set! This set consists of 744 classic K'NEX pieces that allow you and your children to create 3 different models, one at a time.